A few days out we heard an ear­ly hur­ri­cane was head­ed our way. We stopped at a small mari­na and pre­pared. We took all sails down, laid them out on the lawn to fold them, and stored them inside our boats. At the mari­na operator’s insis­tence, we anchored out in the cove with at least two anchors each. Then he came around to each boat, picked up every­one who want­ed to go ashore, and brought us to the bed and break­fast he also oper­at­ed. How­ev­er, since his wife was away, there was no break­fast. But he did loan us his truck to go to the store for a few sup­plies. A cou­ple of the hus­bands stayed on their boats. For­tu­nate­ly, my hus­band wasn’t one of them. Also for­tu­nate­ly, the hur­ri­cane turned west a few miles before it reached us and nev­er hit us. It was dou­bly for­tu­nate, since the house had lots of win­dows that the own­er didn’t cov­er them in the least. The next day we trav­eled a few miles south and came to a mari­na where one boat had sunk in its slip after hav­ing rubbed a hole in the prow as the waves bounced and shook it vio­lent­ly against the pier. All our trav­el­ing inspired my mys­ter­ies. I do men­tion a hur­ri­cane in one of my books, but the char­ac­ters involved are most­ly on land. So, although where I live is in the midst of Amish ter­ri­to­ry, and those sto­ries do well, I was much more inter­est­ed in set­ting my mys­ter­ies on Chesa­peake Bay. We no longer go boat­ing, but I can still enjoy the water­front in my imag­i­na­tion. A side note: Often boaters have dogs aboard, some even have cats or birds. One cou­ple we knew well had a large dog. 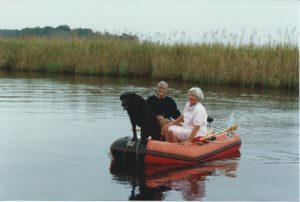 Some­times, when the shore was lined with tall grass, find­ing a spot for Wat­son (the dog’s name, the couple’s last name was Holmes) to do his busi­ness was dif­fi­cult (like in the pic­ture seen here). Hmm, maybe I should put Wat­son into a book. What do you think?